This is a story about sheep. Not counting them or eating them as lamb chops, but, rather, how they appeared in the Hebrew Bible and then disappeared and how extraordinary detective work and determined women saved them and brought them home. It is about where they are now and how they are entwined with high fashion in Columbus, Ohio. It all began with the patriarch Jacob, who fathered 12 sons whose names were given to the original 12 tribes of Israel. But, in addition to his children, Jacob also fathered…spotted sheep. For 14 years he had worked in Haran as a shepherd for his deceitful father-in-law Laban; seven years to win the hand of his beloved Rachel, who Laban replaced with Leah on the wedding night; and then another seven years to marry Rachel. Laban must have thought that he had gotten the employee deal of a lifetime: all Jacob wanted was some spotted livestock. But Jacob was very shrewd, and he had a long-term business plan in mind. He would practice selective breeding and animal husbandry. With consummate skill, Jacob began to breed the speckled and spotted sheep. He lived well and prosperously in Canaan with his family and his huge, strong, mottled flock. But then there was a terrible drought, and Jacob moved all his animals to the land of Goshen in Egypt, where his son Joseph, the dream interpreter, was a high-placed noble. From that time on, the trail of the speckled sheep was shrouded in intrigue and mystery. 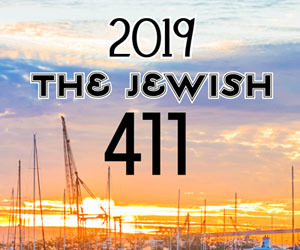 For Mimi, an American who had recently made aliyah to Israel, “it was almost like discovering the Ark.” She devoured the rest of the article, and learned more: “The first flocks in the United Kingdom can be traced back to at least l760 and it is thought they were based on stock imported from South Africa. In the late l960’s the breed was classed as rare; in fact, it was nearly extinct, but through the efforts of Lady Aldington, The Jacob Sheep Society was formed to preserve and strengthen the breed.” To Mimi’s amazement, she learned that there were 2,000 members of the Jacob Sheep Society and 30,000 Jacob sheep in the United Kingdom, one of the only countries where the breed was still found. And, according to Mimi, Lady Aldington had a passionate conviction that the sheep of the parklands in the United Kingdom were the descendants of Jacob’s flock. Mimi was trembling with excitement. She’d done so many things in her life, but never before had she been a detective. Was it possible that she was now on the trail of the patriarch’s sheep? Mimi found out everything she could about the sheep whose other distinctive characteristic is that they often have two, four or even six horns. When Jacob gave his favorite son Joseph a coat of many colors, was it made from the multi-colored wool of this rare breed? It was certainly possible. Were there Jacob sheep in England at the time of Shakespeare? The Bard certainly knew about them, and referred to Jacob’s flock in l600 in “The Merchant of Venice.” Was there any truth to the speculation that after Jacob sheep sojourned in Egypt, they traveled to Spain via the coast of North Africa and Morocco? Perhaps that was the route by which they came to England. The more Mimi learned, the more she wanted to see the sheep face-to-face, and she arranged for a trip to England and an encounter of the very close kind at a farm. It was a highly emotional meeting for Mimi and the Jacob sheep: “When I saw them, I wanted to gather them into my arms and just love them like babies. I get kind of teary just remembering,” Mimi said. She determined that she would bring the descendants of Jacob’s sheep back to Israel, and house them in Jerusalem’s Biblical Zoo. She contacted Lady Aldington directly, and the latter was receptive to the idea of sending a pair of Jacobs to Israel on aliyah. The woolen ball was now really rolling, and it seemed like Jacobs would soon be baahing in their ancient grazing grounds. But of course, all good detective stories run into what seems like a brick wall. 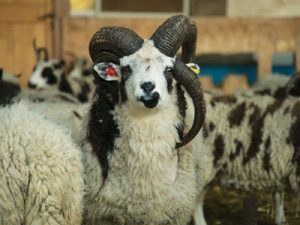 The Israeli Ministry of Agriculture, Sheep Department, said it was out of the question to import sheep from Britain, and the villain was none other than…Mad Cow disease. There was a firm ruling against importing any meat animals for human consumption, and Jacob sheep fell in this category. Mimi, whose husband Moshe was on board with the dream of returning Jacob sheep, was forced to give up. Mimi left for Springfield, Missouri to tend to her sick mother, and the baaah of her beloved sheep became a background bleat. Then, one day, she got a very excited call from Moshe. Some people they knew had been visiting the Safari Zoo in Ramat Gan and had seen what else? Spotted sheep. Moshe rushed to Ramat Gan and there, by some miracle, already on Israeli soil and unbeknownst to anybody, were the Jacob sheep. No one had connected the origins of the spotted ones to the flocks of the patriarch. The Safari Zoo agreed to help Mimi realize her vision. Now Mimi was sliding into sheep home plate. All she and Moshe needed was for one pair of Jacob sheep to be transferred from Ramat Gan to Jerusalem, but there are always more snags in a detective story: the Safari Zoo had only one ram, and they weren’t about to give him up. But, with Mimi’s persistence and persuasion, they promised that if one of the ewes gave birth to a ram, a male and female Jacob would be sent to the zoo in Jerusalem. And so the waiting for mating began. Finally, an ewe gave birth and one of the babies was a ram. Now there was a couple available for transfer. It took four months before the young sheep were old enough to travel to the Jerusalem and the Biblical Zoo. The wooly Diaspora was finally over. Of course, the he-sheep was named Jacob and the ewe was his beloved Rachel. Poor Rachel died and was replaced by another Rachel. In 1999, that Rachel died, but the male mated with another sheep. The problem was that the new female was not necessarily a Jacob sheep, so there was likely crossbreeding. Mimi’s husband Moshe got seriously ill, and Mimi left Israel to tend to him until his death a year and a half ago. During that time, she lost track of the Jacob sheep. The vision of having the pure Jacob sheep returned to Israel seemed hopeless until…along came Jenna Lewinsky. Jenna, originally from South Africa, and her husband Gil, who was born in Israel, were living in British Columbia, Canada, when they heard about the black and white speckled and spotted Jacob sheep. They decided to raise Jacob sheep, and when their flock expanded to more than 100, they left their jobs to transport the sheep across Canada to Toronto, where, after quarantine, they would be flown to Israel. Air Canada came onboard, and it was the largest animal airlift they had ever done; it necessitated 11 separate flights to Tel Aviv. Then the sheep had to clear customs and were quarantined again in Israel. Five of the sheep died from the cold and wet weather; they were not yet strong enough to survive the intensity of their travels. Finally, the sheep went to Nes Harim overland. But the duo needed to hire security for the sheep, as livestock theft is a problem in Israel. The cost of the transplantation of the sheep from British Columbia was $80,000; happily, it was covered by private donors. To the immense joy and relief of Jenna and Gil, the Jacob sheep were finally home in Israel, where they could be tended by the modern-day shepherds. Although there are historians who totally support the lineage of the sheep to the patriarch Jacob, some DNA scientists have cast doubt on the exact lineage, which may not be provable. But the shepherds don’t care; they have brought the flock back to Israel, and they would like to have a heritage farm so visitors can meet the speckled and spotted wonders. But this is not the end of the Jacob sheep story. Recently, my husband Paul and I had an extraordinary farm to fashion, small group experience in Columbus, Ohio. We met a startlingly creative and ecologically conscious designer named Celeste Malvar-Stewart. The wool for her red-carpet-couture dresses comes from sheep she personally knows. She drove with us to a farm about 45 minutes from Columbus where we met the female farmer, Rachel Najjar, and her sheep. I took a special liking to Gandolph and hope the feeling was mutual. A gourmet, vegetarian, organic lunch was served on the porch of the farm, and then we returned to Celeste’s design studio in Ohio. Inside, a long table was covered with sheared wool from the sheep we had met, and among them was Gandolph. We chose batches of the wool that appealed to us, and Celeste guided us through the process of making our own designer scarves. For some reason, I decided to twist the wool in an intricate fashion, and the others were finished long before I had twisted the last fibers. Karmically speaking, this was meant to be, because Celeste and I had time to chat. She mentioned that she was just commissioned to do a fashion show for a Dominican university, and she hadn’t found the right theme yet. Of course I asked her if she had heard of Jacob sheep, and of course she had not. When I told her the story, her eyes lit up. “Yes, yes, yes,” she said, “This is perfect.” Biblical wool for the Dominicans. It was a match made in wooly heaven. Over the next week, I connected Celeste to Mimi and Jenna, and the next thing I knew Jenna was sending Celeste photos of shearings from her flock, and Celeste was picking out the wool she wanted to use in her couture gowns. As I write this, the wool from the Jacob sheep is on its way to Celeste, and that original Biblical flock will have its first fashion show! I hope you’ll be able to visit the Jacob sheep in the heritage farm, and, in the meantime, you’ll probably love the farm-to-fashion outing with Celeste. When you wear your scarf, you’ll think back to the patriarch and smile. Celeste’s website is malvarstewart.com, where you can contact her and book a Farm-To-Fashion one-day workshop (a minimum of four people is required). 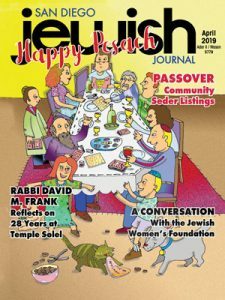 About the author: Judith Fein, formerly of San Diego, lives in Santa Fe, New Mexico, and has contributed to more than 100 publications and written two books. She is currently writing a book about How To Communicate With The Dead. globaladventure.us.